Why it comes down to momentum! Want to learn the insider secrets of the top 1% sales achievers? Discover the inspiring techniques of 20 sales VIPs so you can climb the ranks and bring in the biggest commissions of your career. Fed up with the same old sales results? Tired of advice from so-called sales gurus who don't actually sell for a living? Want to learn closing techniques from real-world doers? 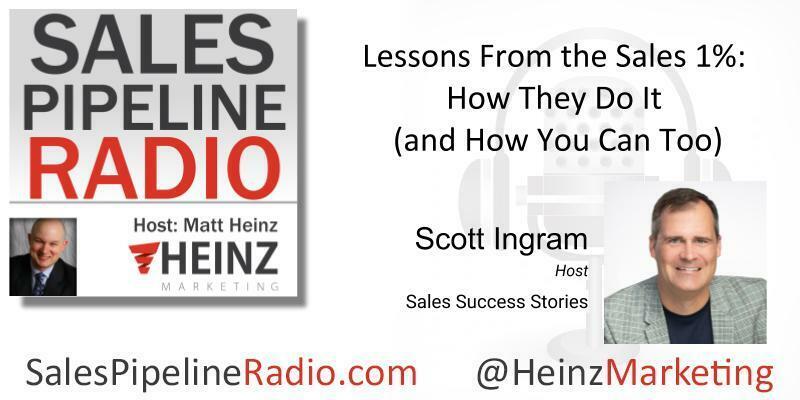 Account director, podcast host, and top 1% achiever Scott Ingram has spent his whole life obsessed with sales. With nearly two decades of sales experience under his belt, he’s ready to share 60 inspiring stories to help you finally sell like a heavy hitter. Sales Success Stories - 60 Stories from 20 Top 1% Sales Professionals is a powerful collection of the tales of triumph—and failure—from 20 amazing sales MVPs. Divided into four motivating sections covering mindset, relationships, sales careers, and sales processes, this book will show you how high achievers sustain stellar results on a daily basis. If you’re an ambitious and dedicated professional ready to climb the ladder to the top, then you need this road map to career victory!